Every fall, the search for next year's James Beard Award winners begins with a call for nominees, Santa's list of all the kitchen hands who done good in the past year. Last week, I sized up our Seattle rivals in the regional chefs category, who received an attention-grabbing four out of five nominations last year. We gotta get back in the game, so I thought I'd check in with one of our own James Beard Award winners for an instructive meal on what makes a winner. We've had three in the Best Chef Northwest/Hawaii category over the years: Roy Yamaguchi (1993), Alan Wong (1995) and George Mavrothalassitis (2003). Timing was good to check in with Chef Mavro, because he's just introduced a new fall menu that shows he's not resting. His status as sole chef-owner is unique for a restaurant of such high-end caliber. It must be liberating to be able to create outside the watchful eyes of teaspoon-counting CPAs, and it's clear that no expense is spared to bring the finest ingredients to the table. As an executive chef at Halekulani and the Four Seasons, Maui, before stepping out on his own in 1999, I don't think "compromise" is in Mavro's nature anyway. Chef Mavro is one of only a few rooms in town that can manage to be intimate, cozy and festive at the same time, so it's been a hit for holiday planners, something to think about this time of year. Simply sitting and enjoying the flowers and soft lighting feels like a privilege. It's a great place for couples (but guys, don't try to impress a girl unless you know your way around a table), and in Gourmet magazine's October issue, editors voted it the best restaurant for conducting business. The staff manages to be professional, friendly and helpful; never snooty. The chef's reputation is downplayed so that a visit actually becomes all about you. Rather than feeling confined by the prix fixe menus, you're welcome to make substitutions and ask for smaller pours on the wines if you need to shave costs or drive home later. 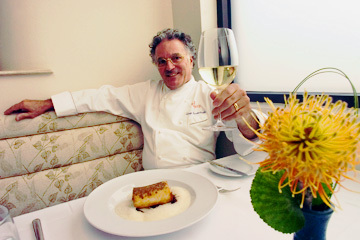 Chef George Mavro offers a toast over his dish of Coriander-Crusted Onaga. A LA CARTE meals are available, but when dégustation menus are available, I usually go that route to experience the range of a chef's vision. Mavro offers a four-course menu for $66, $102 with 4-ounce wine pairings for each course. A six-course menu is $93 without wine, $137 with 2.5-ounce wine pairings. Prices are on par with the best restaurants coast to coast. Not everyone can afford this, but not everyone is ready for Mavro's food, either. It's the culinary equivalent of fine art when most people are more comfortable with paint-by-numbers fare. Here, the layering of essences, aromas and textures demands that you pay attention, take your time, savor. The effort would be wasted on those who simply swallow. Dishes arrive like precious jewels, highlighting the products of our land and sea wherever possible. An amuse bouche of refreshing almond, cucumber and tomato gazpacho set the tone for an intense, flavorful adventure. The four-course menu is the simpler of the two, opening with a salad of crunchy Big Island maitake mushrooms sautéed in white truffle oil and topped with a bouquet of Sumida watercress. It's followed by crisp-skinned day boat catch served with a garlic-saffron emulsion and creamy English pea purée, and strip loin served in a tomato-tarragon sauce. There's a comfort appeal to the latter, but if you'd prefer to increase the elegance quotient, I'd sub it for the roasted lamb or lobster. The meal ends with patrons' favorite of lilikoi-filled malasada served with guava coulis and pineapple-coconut ice cream. It's the only item Mavro's kept on the menu since opening, and he doesn't dare drop it because people continue to demand it. It's the six-course menu that shines, starting with a can't-go-wrong serving of seared Hudson Valley foie gras atop a poached Pacific oyster and braised savoy cabbage with accompaniments of green apple kanten, red currants and spice bread. Then hold your nose for coriander-crusted onaga surrounded by a briny salad of Molokai ogo and fricassee of wood-ear fungus, all enveloped in a frothy and potent sea urchin sabayon. The sabayon will likely be a hit with uni lovers; for everyone else it is an acquired taste, and it is just like an artist to push people's boundaries rather than play it safe. After all, anyone can throw a grilled steak on a plate and be loved. It takes more to be a James Beard winner. I wouldn't say sea urchin is my favorite food, but I applaud the chef for this tolerable treatment. The next dish of a couple of sections of Keahole lobster tail is one that's easy to love, but the chef doesn't rest, offering it with braised leeks, crustacean "essence" flavored with star anise, and a creamy purée of celery root with a touch of wasabi, among the inspirations from a recent trek to Osaka, Japan. tasting PORTIONS seem small, but because of the slow process of savoring each delicate morsel, I started feeling full halfway through. Still, I had to finish the trio of lamb medallions served with fava beans and a fricassee of honshemeji mushrooms. By the time the Big Island goat cheese and fig serving arrived, I could only manage a few nibbles, as well as with the dessert of white-and-dark chocolate marquise and its intense green tea cappuccino foam. I sent it home with a friend, along with the post-meal mignardises. There was only one thing left to do, and that was to have our pictures taken with the chef, like so many of many other patrons. As one staffer said, "Everyone wants to have their picture taken with the chef." I think people do recognize when they're in the company of a star.